But what was the first thing that popped into my head when the alarm went off (outside of the show I’m going to tonight that I am completely geeked out for)? The Cliff Lee/Mark Lowe trade. Conor already posted his thoughts about it (some of which he told me got him verbally assaulted in a QFC last night by a complete stranger), but I have a few of my own. I take lunch at about 2pm at my externship. I’ve been using it to access my email and Twitter via my phone, because I have no computer access there. Needless to say, both email and Twitter were exploding around 2pm yesterday, and it was all I could do to keep up. Lee being traded was completely expected. I was hoping they’d give him a start last night, one more time, but it wasn’t to be, that’s fine, and I accepted that. But moments after that announcement came the revelation that Mark Lowe had also been thrown into the mix. And that, kids, that upset me more than knowing that Lee was going in the first place. I will be completely honest and divulge that it was all I could do to stop from winding up the Swear Train in a room full of strangers, or running outside the secure building to call someone I knew would care so that I could yell at them for a few minutes and blow off some steam. Instead, I sat in my chair frantically emailing and reading Twitter, fidgeting uncomfortably, and keeping an eye on the clock to make sure I wasn’t late for the rest of my shift. Mark Lowe’s been here for 6 years. And while I haven’t been a Mariners fan quite that long, Lowe’s always been a member of the team since I have. I didn’t have a lot of faith in him at first, and probably said some fairly mean things about him a few years ago, when his command was off because of arm issues. Some of you may remember a handful of times I put him on notice. But he won me over, and his relief pitching became a highlight of any game he was in. The sideburns, the crooked smile, the scruffy confidence, the bullpen helmets, the pitch speed and his ability to get batters swinging right past the ball – all of it added up to a bullpen guy you could count on. 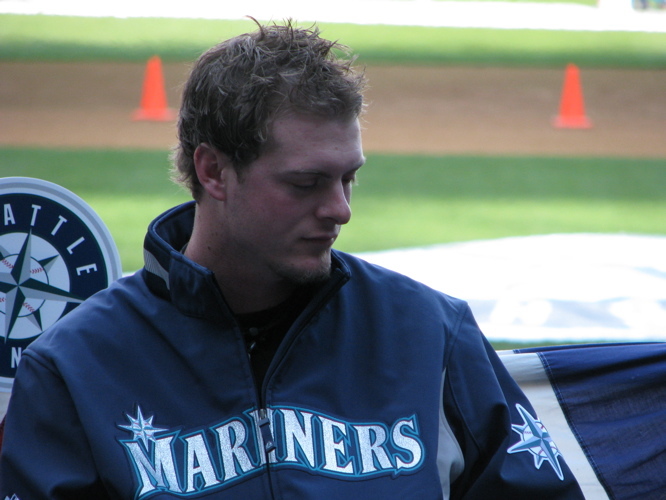 He was also a leader in the pen – and during the last game of 2009, when he could not be around due to some family issues (if memory serves), the bullpen guys carried his jersey between them around the field when the team took their over .500 victory lap for the fans. He was obviously important to them, and they knew he was important to us. So this stings a bit more than if it had been just Lee. I expected Lee to go; I did not expect Scruffy McSideburns to be taken with him. Sure, there is a distinct and very real possibility that he will not recover from his herniated disc issues and bounce back to the guy he was last year. But with some players, attachment renders that a thing I’d like to find out on my own, even when it’s against my best interests. I think the saddest moment of the entire day for me was this Twitter message last night from Ryanna Hartley. Ryanna was the keeper of two of the bullpen’s gladiator helmets after they were taken away by MLB. Lowe said during this year’s FanFest interviews that they were eventually allowed to have one of them back, but Ryanna volunteered to take two of them, and come to every home game, braving the drunks in the Bullpen Landing, standing them neatly on rack next to – but not inside – the pen. Before the last game of 2009, I approached Ryanna down by the pen, my intent to get her contact information to do an interview for the blog. She was talking to Lowe, and when I was able to get her attention, her eyes were a little pink. She informed me that Mark had just given her the two helmets she had been keeping vigil on for so long. It obviously meant a lot to her, and that sort of thing – when players can do something like that for fans – means a lot to me. Mark Lowe was never going to be our ace, but he was a great guy to have on the team, and it will take a while for me to get over his loss. I know we have Justin Smoak now, and maybe three other guys who can either be worked into a trade or valuable pieces of the major league team, and that is all very well and good. Just give me a bit of time to grieve, and I’m sure I’ll warm up to the whole Smoak thing soon enough. In the meantime, goodbye Mr Lee and Mr Lowe. May you do your new team proud. This entry was posted in Uncategorized and tagged goodbye cliff lee, goodbye mark lowe. Bookmark the permalink. I will miss Cliff and Mark, and it will be tough to see them playing for a division opponent. My hope is that Cliff helps the Rangers win the division and get into the playoffs this year (when the M’s are out of it anyway), and the players we got from Texas really help the M’s long term. Gotta hope that Trader Jack knows his stuff!